Star Trek is not a good game. It’s not even a decent licensed game. It’s just bad. The source material is wasted, as is the voice talent. The visuals are dated and uninspired. The controls are sloppy. The cover system is abysmal. There are three different hacking mini-games which are used over and over and over again. 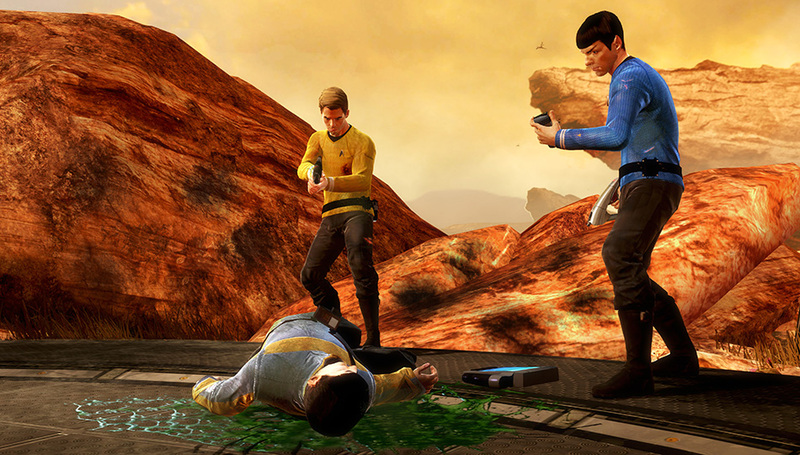 Much of the gameplay will be tainted by the sickly blue hue of your tricorder, an abusive adaptation of the Batman: Arkham titles’ detective modes. There is no joy here, only misery. The first mission is a tutorial on how to move and use your tricorder. Use your tricorder to scan the environment and earn XP so you can upgrade your weapon and, well, your tricorder. Does it seem like I’m mentioning “tricorder” a lot? Because I don’t want you to lose focus on the tricorder. You really need to use your tricorder. You’ll use your Tricorder to lock and unlock doors, revive your partner, check your objectives, find way points, complete (once again) three different types of hacking mini-games (dozens of times), and a host of other things. Occasionally, you’ll actually scan something of relevance, like some new tech or a new weapon, but you’ll be so numb to the experience you’ll forget to care. I’m quite certain I used my tricorder more than I used my phaser. Not just in this level, but the whole, damn, game. After the first grating mission I moved on to New Vulcan. Here’s where the game actually let me get into a firefight. Finally, some hot phaser action. Seeing as how I was shooting at infected Vulcans, I wanted to stun the poor bastards instead of kill them. I shot one with a stun beam, and he immediately clutched his head, writhed around while emitting a bluish glow for a few seconds, recovered, then resumed shooting at me. It was here the game informed me that I had to first stun blast my enemy, then run up to him and perform a melee take down. That’s when I decided I needed to take a break. Once I recovered I again attempted to stun my infected Vulcan chum. I ran up to him and pushed the X button. The game made a weird noise, the screen distorted, and the Vulcan was stunned. I don’t know what exactly happened, but it sure appeared to be a bad visual effect designed to hide a ridiculous melee animation. I stunned several enemies throughout the game, and I still have no idea if Kirk punched, kicked, or kissed them into unconsciousness. I eventually upgraded my phaser so I could stun enemies with one shot. That made things tolerable. After walking through several same-y corridors, stunning one infected Vulcan at a time, I finally happened upon a small group of enemies. We’re talking like four or five infected Vulcans. Oh boy! Action! I took a few shots at some of my tainted allies. They ran around and had a hard time finding the right side of cover. So I shot them some more. My AI controlled Spock (My co-op partner wasn’t home yet. Don’t worry, I’ll get to the co-op in a bit) stood in the hallway and did nothing. I noticed my phaser kind of sucked as far as aiming was concerned. I could upgrade my accuracy eventually. (Man, these upgrades seem more like “essentials”) Then I noticed I was being shot through cover. I’m not sure if it was because my cover was designed to be destructible or if the game just hated me. I was about to find out. I had incapacitated all but one final Vulcan. I shot him in the head. By now I had given up on stunning these wretched creatures. I shot him in the head again. He seemed quite resilient. Then I opened up on his pointy-eared skull with one of the lame secondary weapons and he didn’t even flinch. He had glitched invincible. So the game did hate me. Now I was treated to a show as he tried to take cover in front of objects, shoot at nothing in particular, and occasionally shoot at me. I fired everything I had at him, and he didn’t die. I gave up and reloaded my checkpoint, slogged through the same same-y hallways, and fought the group again. This time he died like everyone else. Ah, the old invincible enemy bug. Fun. This actually happened again later in the game. I had to restart checkpoints due to AI wandering off a few times, too.